When it comes to public relations, the much-maligned AR-15 has had a rough go of late. Blamed for everything from the bubonic plague to school shootings it was actually used in (because as we all know, it’s never the perpetrator), it would be easy to be duped into thinking the world would be a veritable paradise if only this particular scary looking “assault-weapon” were somehow legislated out of existence. Granted, the lofty rhetoric employed by liberal politicians, gun control groups, and well-coached, albeit sympathetic Parkland students is sometimes difficult to defend. Despite the multiple failures at multiple agencies that could have prevented or at least mitigated his crime, the fact that killer Nikolas Cruz did indeed employ the weapon to murder 17 students in a place they should have felt safe is incontrovertible. Which creates an ideal opportunity for the Left to employ the best tool at their disposal - rhetoric. And yes, especially when it’s skillfully employed by kids who might otherwise be engaged in playing video games and eating Tide pods, rhetoric can definitely be a powerful thing. Which makes countering it even more important, but how? Sure, we could try - you know - facts, and they ARE on our side here. For example, even though it has admittedly been used in several high-profile school shootings of late, the AR-15’s involvement in overall crime in the United States is much less than the fear-mongers would have us think. Even NBC admits that “despite its use in many mass shootings, the popular AR-15 rifle accounts for relatively few murders,” - or, to be specific, significantly less than the 3 percent of overall firearm homicides rifles of all types accounted for in 2016. This, despite the over 15 million AR-style rifles in America today. There’s more, of course, most of which has been covered exhaustively here on Townhall. But facts bolstered by statistics aren’t necessarily the best way to counter rhetoric. No, the best way for that is to use equal or more powerful rhetoric, and the good news is our side has plenty of that too. To that end, let’s review a few ways the much-maligned AR-15 style rifle has been employed to actually SAVE innocent lives rather than take them. After all, are liberals really saying that the people listed below should have been assaulted and even killed in the name of ridding the world of the weapon they successfully used to defend themselves? The answer, of course, is yes. That is indeed what they’re saying, and what they mean, though few will admit it. But we aren’t trying to convince hard-core liberals here, just ordinary Americans who might, given the current political situation, be inclined by their rhetoric. March 2017. 23-year-old Zach Peters woke up to “loud bangs” in his father’s kitchen. When he went to investigate, it was a good thing Peters took his AR-15 with him because in his kitchen were three intruders dressed in all black, one of whom was armed with a knife and another with brass knuckles. In an act that was justifiably ruled as self-defense, Peters opened fire and deprived the world of three more scumbags. April 2013. A drug addled Jasper Brisbon, 32, forced his way into a Philadelphia couple’s apartment and continued to press his advance despite multiple requests from the armed resident to leave. The resident finally used his legally obtained AR-15-style weapon to fire one shot at Brisbon, hitting him in the torso and eventually killing him. February 2013. A “gun-slinging couple” who tried to rob what they thought would be an easy mark, a tax preparation service, got “an AR-15 surprise” when an assault-rifle wielding security guard sent them packing with his scary looking gun and a couple of near misses. January 2017. Two Houston gun store employees successfully fought off five armed would-be robbers with the help of, you guessed it, an AR-15. May 2014. Homeowner Jonathan Haith used an AR-15 to shoot an armed intruder in his own hallway. January 2013. A couple of armed criminals who had broken into the apartment of a Rochester Institute of Technology student decided to leave and try a softer target when they confronted the barrel of the student’s AR-15, which was unloaded but “scary looking” enough to do the job with nary a shot fired. July 2015. Three armed robbers who tried to break into a Milwaukee high-end clothing store by ramming it with a stolen van were met with a surprise of a different sort in the form a hail of bullets from owner Rami Murrar’s AR-15 rifle. Not only was the robbery unsuccessful, but one of the intruders got a few bullet wounds and a prison term for his efforts. January 2013. When two burglars broke into their home while their parents were gone, a 15-year-old Texas boy used his dad’s AR-15 to defend the life of both himself and his then 12-year-old sister. While the AR-15 rifle can certainly wreak havoc when in the hands of an evildoer, it can also be a powerful tool for defending the innocent. Further, as the last example attests, its lightweight frame and easy to use mechanics make it a useful equalizer that women and even teenagers can use to defend against those who would do them harm. Let’s not forget the much-cited example of Korean shop owners using the weapon to protect their stores from looters during the LA riots. Indeed, there’s a reason it’s been dubbed “America’s Rifle,” and it’s not because of psychopaths like Nikolas Cruz. 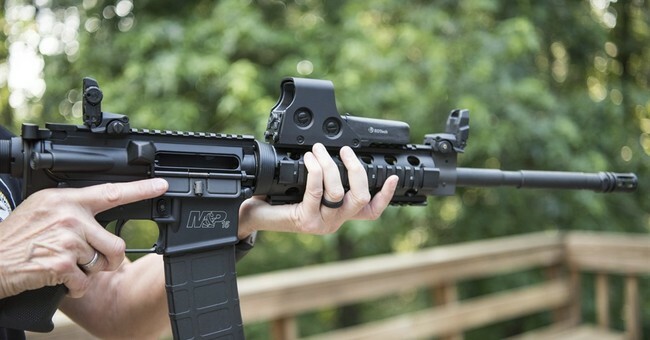 Sheriff Jim Wilson writes, “In fact, the AR is a rather good choice for home defense. It is lightweight and the caliber choices are effective against armed criminals. Its profile is one that is readily recognized by most people and the crooks who see it in your hands will get the idea that you mean business and can probably take care of business if forced to.” Wilson also cites the fact that the weapon is “short and portable,” thus helping homeowners avoid the “defensive mistake” of allowing the barrel to alert intruders of the defender’s presence. If, as even the most rabid gun control proponent would admit when pressed, the vast majority of America’s approximately 15 million AR-15 owners would use their weapons for self-defense rather than for unlawful purposes, what justification can possibly made for disarming these people in an effort to try to disarm criminals who wouldn’t follow the law anyway? In the end there’s no logical justification, only empty rhetoric.